We describe a capillary electrophoresis-mass spectrometry (CE-MS) method for newborn screening of a representative amino acid metabolic disease, namely, phenylketonuria (PKU). Underivatized phenylalanine and tyrosine in a dried blood spot (DBS) were simultaneously determined by CE-MS equipped with an ionophore membrane-packed sheathless electrospray ionization interface, which was developed by our group. The method was optimized for rapid determination of the underivatized amino acids, phenylalanine and tyrosine extracted from a DBS. Under the optimized conditions, the limit of detection of phenylalanine and tyrosine (signal-to-noise ratio, 3) was 0.03 and 0.07 mg/L in DBS, respectively, with a CE run time of less than 3 min. For repeated runs of a sample, coefficients of variation (CVs) for migration time were less than 3.7 %, whereas CVs for the area ratio under the curve were 2.1 and 2.9 % for 20 consecutive runs of 49.5 mg/kg Phe and 36.2 mg/kg Tyr, respectively. However, the relative standard deviations of intra- and interday assays for DBS samples were <6.2 and <5.8 %, respectively, which were substantially due to sample extraction from DBS. 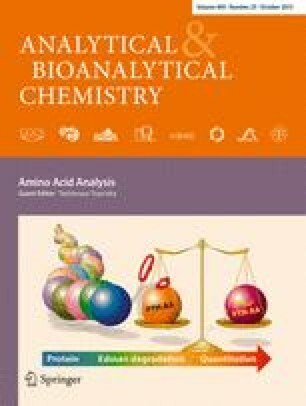 The analytical method was applied to real clinical samples of Korean neonates, and results were compared with those of conventional methods for PKU diagnosis, which required reference analytical methods such as isotope dilution CE-MS or high-performance liquid chromatography-mass spectrometry for quality assurance of the conventional kit-based assays. The distinct advantages of high sensitivity and extremely low sample volume, as well as a simple, easy, and economic sample pretreatment, were demonstrated for the proposed method. The online version of this article (doi: 10.1007/s00216-013-6999-6) contains supplementary material, which is available to authorized users. This work was supported by the Korea Research Institute of Standards and Science under the project “Development of Protein Measurement Standards,” Grant 13011017.